This does sound like a very comforting dish. 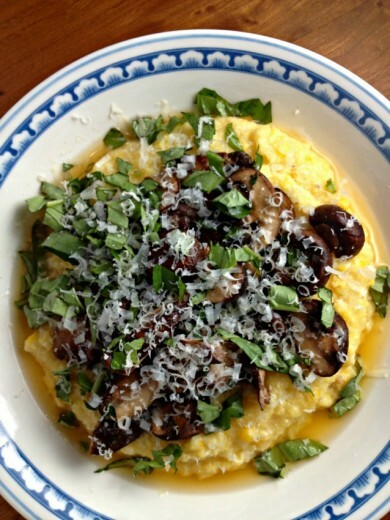 I have although never had the opportunity to try polenta so that needs to change. Oh Dana, I’m so making this! 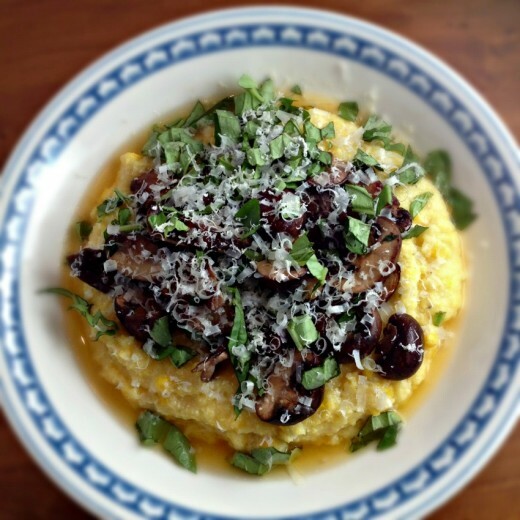 I’ve never thought to add ricotta and fresh corn to polenta and I can imagine how perfect it would be. Love this meal a lot. And total comfort food which for me is food that is unfussy (though I might skip the 3 pans part of this recipe and just stick with the polenta and the mushrooms). Polenta is right up there on my list as well. The New Vegetarian Epicure has a gorgonzola and leek version that I absolutely love (very rich, but worth it). Risottos are near the top as well. Going into fall, wild mushroom risotto can’t be beat (am going out for those chanterelles soon!). I also use Anna’s (NVE again) recipe as my base there – but it’s evolved considerably over the years, sometimes including things like leeks or chard. So happy to see you are settling in and cooking delicious things again! I have to be honest here, I have never made polenta. I am Mexican/Spanish, grew up in the U.S., made food from all over the world my whole life, in my thirties, I am in culinary school, and I eat everything! But never made polenta. So the funny part is, this week I bought Bob’s Red Mill cornmeal to make polenta, then I came across your post. It looks amazingly creamy, beautiful, and delicious. The mushroom tomato broth is calling my name. Now I cannot wait to make polenta! Made this tonight Dana and it was awesome. Put a little chicken sausage on the kids’ bowl and everyone was happy. The broth is divine. Ive made corn broths before and found them too strong but this one is light and flavoured perfectly. And thanks for posting it today!! Polenta is one of my comfort foods for sure. I could eat a huge bowl of it. All by it’s lonesome. And be quite content. But with fresh corn…oh yeah that sounds way better. I have my oatmeal salty AND sweet. It must have brown sugar (or maple syrup) and raisins, but it also has to have a significant pinch of salt in there. Polenta and risotto. But my all-time comfort food is Japanese–tamago gohan. It’s a bowl of piping hot Japanese rice with a raw egg mixed in, seasoned to taste with soy sauce. Quick and easy, and oh so, comforting! I think I might be starting to agree with Cathy. Comfort food is great, but it’s only comforting while you’re eating it. Since Sandy has stranded me at home all day, I have been “comforting” myself quite a bit. Maybe tomorrow I will comfort myself with your polenta. And then I will go to the gym. Or take a nap. We have chanterelles in the area, they’re just a spring instead of fall crop here. Your Oakland hills have loads! You should go hunting next spring, so fun!